“And now for something completely different!” to quote Monty Python’s Flying Circus. In my early college years, I worked in the classical department at Tower Records and had access to thousands of titles. Never did I run across a CD for clarinet and organ. So kudos to Marco Santilli, clarinet, and Ivan Tibolla, organ, for originality. 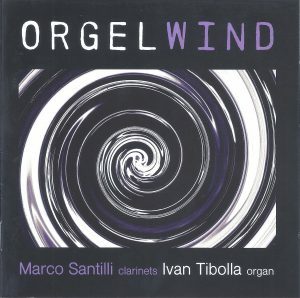 Orgelwind is a collection of short works pairing clarinet with organ. Most of the works on this recording were arranged or composed by the two performers. Works by Claudio Monteverdi, Philip Glass and A. R. Luciani complete the program along with two traditional pieces. Victimae pascali laudes and La pastora e il lupo, the two traditional works, contrast sharply with the contemporary stylings of the other works. The album blends smooth jazz, a Mediterranean-style jazz, and a bit of South American Jazz, which sounds like the child of Antônio Carlos Jobim and Astor Piazzolla, in Milonga by Tibolla. Orgelwind opens with Serenada in minur that gives us a hint of what is coming on the rest of the disc; we get a taste of folk-like music, a quick waltz that morphs into a sultry and virtuosic jazz line, and an organ interlude that sounds as though J.S. Bach wrote it. The fourth track on the album, Musik des Einsamen (Music for the Lonely) couples organ with the alto clarinet, poetically the loneliest of the clarinets. Santilli gives us a respectable and mournful alto clarinet tone, but it is in a subsequent track, La pastora e il lupo, that we hear absolutely beautiful alto clarinet playing. The strangest work on the disc has to be Chanson Balladée, a work from 1977 written by Italian film composer A. Riccardo Luciani. The strangeness of the work comes from its neo-Renaissance aesthetic, although written for a TV show in 1977. Even the internet shows signs of confusion with many sites attributing it to Guillaume de Machaut (d. 1377). Those seeking a genuinely unique recording spanning a variety of genre should find this one bewitching. Through their technical and musical virtuosity, Santilli and Tibolla cobbled together a stunning recording that is both deep enough to warrant focused listening, and light enough to serve as background music for a soirée. This recording is just plain fun from beginning to end, showcasing a variety of different folk music genres or influences. 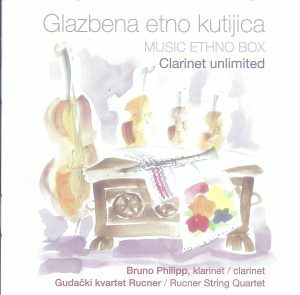 Bruno Philipp not only displays his talent as a clarinetist on this album, but also his skill at arranging. This is shown in the opening piece, which is an arrangement of Bela Kovacs’s klezmer-inspired Sholem alekhem, Rov Feidman! for clarinet and string quartet, the medium for all but two pieces. After Philipp’s arrangement, comes a beautiful arrangement of Paquito d’Rivera’s Kontradanza that Philipp and the Rucner String Quartet play in a light manner and with exceptional style. Mariano Mores, an Argentine composer famous for his tango compositions, wrote Taquito military, which features a hip Latin groove and a great ending. Aside from Nichifor’s Carnyx, the only other unaccompanied piece is the title track Clarinet Unlimited. Consisting of two parts, with the second representing a digital delay and driving jazz-like rhythms, this piece really shows off Philipp’s virtuoso technique. This album also features a number of magnificent pieces by Croatian composers including SlavETNOnija by Marijan Makar. This work begins with a wonderful melody over drones, followed by a dance-like second half. The album concludes with Bojan Milosevic’s Orijentalna elegija, a wonderful klezmer piece in mixed meter, which again shows off Philipp’s knack for this genre. Josep Fuster and Isabel Hernandez have been recording as a duo since 2005 and it shows with the great chemistry and communication between these two artists. 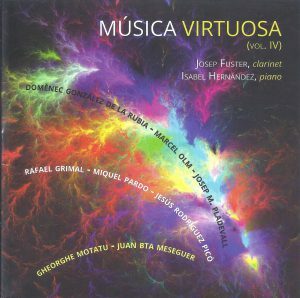 This is the fourth volume of their Musica Virtuosa series. This is an excellent display of a wide variety of styles written by some lesser-known composers. The liner includes program notes written by the composers, which is an attribute. The first three pieces are multi-movement works that display both musician’s exceptional ability to communicate expressively and thoughtfully. Suite is a play on the dance suites with the fourth movement, Bach en el Caribe, being a great hybrid of Baroque harmonies with rhythms from the Caribbean. The third piece on the album is Preludios del Silencio by Marcel Olm and it is absolutely beautiful. The two instruments seem to weave into each other’s melodies, as if it were a conversation between friends. El despatx de Sant Pere was written by Gheorghe Motatu, who is a colleague of Josep Fuster at Orquestra Simfonica de Barcelona I Nacional de Catalunya (OBC). It is a cute, jazzy piece with a great melody. The next track showcases Fuster’s mastery of extended techniques with flutter tonguing and crystal clear multiphonics. Caprici Boreal is the only unaccompanied piece on the album and was written for Fuster, who demonstrates terrific control over large register leaps throughout this piece. Despite some issues with the recording quality, this album is a welcome reference recording of unique 20th century compositions. A native of Upstate New York, clarinetist Jerome Bunke attended the Juilliard School before earning his Ph.D. at New York University, where he later taught. Bunke’s inspiration for this album came from two distinct tributaries: the relationship between composers and clarinetists, and the evolution of clarinet repertoire. By opening the album with Weber’s Grand Duo Concertante, Bunke immediately showcases his even tone and technique throughout the instrument. Together with pianist Hidemitsu Hayashi, he perfectly stitches together the shared melodic lines of this notoriously difficult work. The controlled tempo in the third movement allows listeners to fully grasp the intricacy of Weber’s writing. While technically proficient and tonally pleasing on all counts, Bunke’s interpretation could exploit more of the elegant, dramatic, and operatic nuances that makes Weber so rewarding to perform and hear. The playing from both Bunke and Hayashi is equally precise in the Variations, Op. 33 and the Introduction, Theme and Variations, a work which some attribute to Joseph Küffner rather than Weber. In Souvenir, Bunke collaborates with Elliot Schwartz at the piano, the work’s composer. Written specifically for Bunke, the piece exploits the tonal and technical possibilities of both instruments. Extended techniques are performed with effortless aplomb, and the piece exemplifies the modern-day importance of the composer/performer symbiosis. Vanhal’s Sonata in B-flat Major is one of the earliest and under-performed works for clarinet. Although the recording is at times a bit grainy, the playing is charming and light with excellent attention to nuance in all movements. Baermann’s Adagio and Vaughn Williams’s Six Studies in English Folk Song exemplify the best of Bunke’s playing. Operatic, lyrical phrasing combined with technical seamlessness and Hayashi’s musical sensitivities make these works among the finest on the disc. 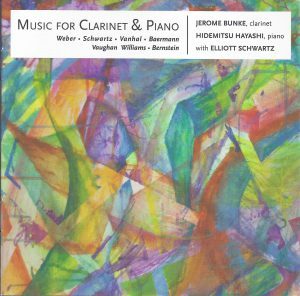 The Sonata for Clarinet and Piano by Leonard Bernstein offers a fun, fitting finale with Bunke’s superb intonation, crisp articulations, and intense rhythmic drive. The album strikes a perfect balance between standard and cutting-edge works and highlights many of the lesser-known pieces in our repertoire. The recording would be an excellent resource for those interested in representative works from a variety of musical and stylistic periods. Clarinetist/composer Lori Ardovino is Professor of Music at the University of Montevallo, and an active performer in Alabama and beyond. 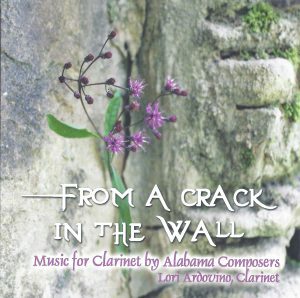 From a Crack in the Wall features music exclusively by Alabama composers. The eponymous work that begins the album incorporates the talents of soprano Melanie Williams, also Professor of Music at the University of Montevallo. Dutifully blended unisons coupled with sublime expressiveness from both Ardovino and Williams result in a perfect complement of performing forces. In James Jensen’s Three Pieces for Clarinet, Ardovino’s excellent execution of harlequinesque gestures across the extreme ranges of the instrument coupled with her dynamic pacing result in a charismatic interpretation that would be an excellent model for those wishing to undertake this short yet demanding work. Music of Toru Takemitsu inspired Alabama native Joseph Landers to write Seven Nocturnes. 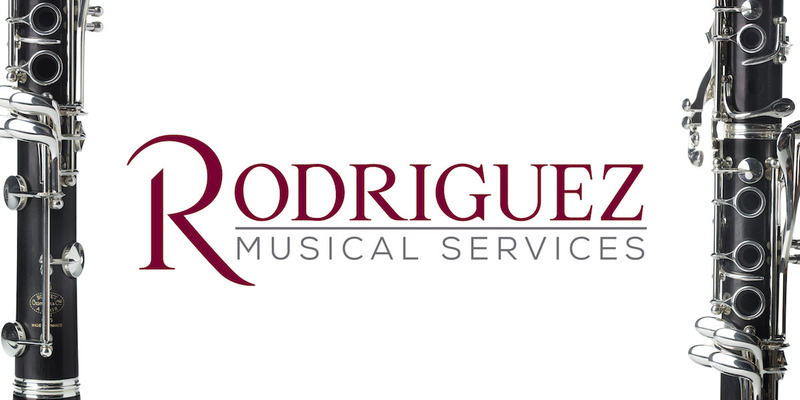 Here Ardovino joins forces with Laurie Middaugh, staff pianist at the University of Montevallo. Although a duo work, there are several extended solo passages by Ardovino and Middaugh, both of whom play with a poignant, reflective character. Ardovino’s Eloquence II is a true showcase of her technical, tonal, interpretive, and compositional command. Smooth intervals, resonant throat tones, refined timbral trills, and clean articulations combine to creative a delightful, emotive, and enjoyable work that is a highlight on this album. Written for Ardovino, Ed Robertson’s Intersections poses several curious rhythmic and technical challenges, which are expertly handled by the performers, though the work itself is less enticing than others on the album. Alan Goldspiel joins Ardovino in his composition Day at the Beach for clarinet and guitar. The three short movements contain conversational melodic fragments, meditative harmonies, and hints of jazz idioms that Ardovino unites successfully through her tonal control and finesse of instrumental color. Ardovino’s witty Bed Riddance closes the album. Again, her duality as a composer and clarinetist is showcased at the highest level, with each vignette providing a balance of content and variety of character between clarinet, voice and piano. Although more detailed liner notes that include lyrics might enhance the album, it contains an eclectic mixture of music that listeners will find appealing, crafty, and enjoyable. Dreamsongs opens with the first of two works by Philip Glass. The 1998 movie The Truman Show contains several works composed by Glass. 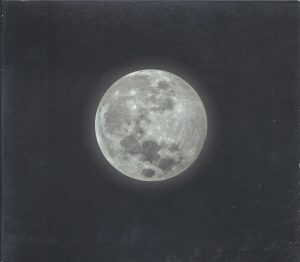 Here, the piece Truman Sleeps opens the album in an effective arrangement by Sean Perrin for the duo. Perrin himself accompanies on the marimba with a halting and hesitant ostinato, as Rob Maciak plays the hauntingly lovely melody on vibraphone, senza vibrato. The album ends with another work by Glass, an arrangement of Opening from his 1982 album Glassworks. In the original piano version, the persistent rhythmic dichotomy of hemiola that drives the entire work is muted in this version. The rhythmic definition is occasionally lost due to the ring of the vibraphone, but otherwise the piece is well performed. The middle section of this CD is an arrangement of short character pieces from Chick Corea’s 1984 album Children’s Songs. The works are originally for solo piano, and arranged here mostly for clarinet and marimba, but sometimes vibraphone. In this collection, we hear Perrin on the clarinet. His tone is both clean and easy; unrestrained and playful, with the right amount of vibrato used sparingly and tastefully. Many of the tracks in this set put a fun, child-like ostinato in the marimba with the clarinet above playing various melodic things, from plaintive introspection to very energetic melodies with occasional folk-like ornamentation. The individual pieces tend to stay musically simple, but a few have wild, kinetic clarinet lines that range from folk to avant-garde. This set contains eleven of Corea’s Children’s Songs, which are presented out of order: 1, 2, 3, 6, 11, 9, 5, 4, 7, 15, & 10. The set closes with #10, which seems appropriate since this work appears to depict a child fighting the urge to go to sleep with a few energy bursts designed to forestall the inevitable, then, suddenly, falling asleep. Sean Perrin and Rob Maciak have done a wonderful job with this recording. The album is well-constructed from the engineering and production to the arrangement of the individual pieces. Their performance is simple, beautiful, and expressive, with the timbres of the clarinet and marimba melding perfectly. 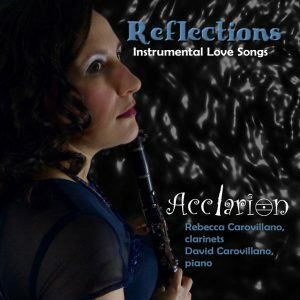 Reflections by Rebecca Carovillano is released as a digital album on Acclarion Records. In a promotional video for the album, the music is described as “instrumental love songs,” that were composed by David Carovillano, husband of the clarinetist. The title piece, Reflections Suite for Clarinets and Piano is four movements, with each played on a different clarinet, lasting about 20 minutes. 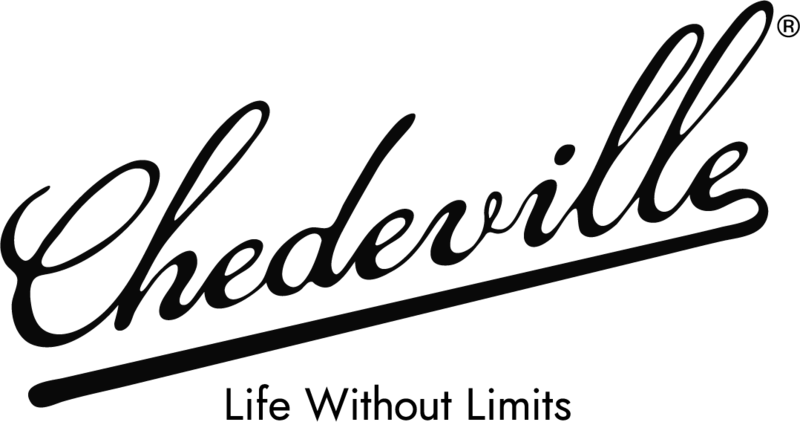 The first movement, “Daydream”, written for E-flat clarinet, highlights Carovillano’s impressive facility on the instrument. She plays this cute, pleasant movement with a delicate, light tone that intertwines with the piano in ways that many E-flat clarinetists would envy. In “Wandering,” on A clarinet, we hear a meandering second movement that definitely reflects its title. Moods change quickly from playful to ominous and back with Carovillano making striking shifts in tone color and style. She uses vibrato tastefully, highlighting the phrases that call for it. Next, she displays a lovely bass clarinet sound in the third movement, “Clouded Focus.” This movement is mellow and mournful before moving into a demanding, darker section that eventually returns to the opening material. Her tone is pure and smooth in all registers. The final movement of this work, ”I Remember,” is written for B-flat clarinet and feels like one is coming home. The melodies are gentle and serene, save for a few unexpected altissimo leaps. While most lines are long and legato, there are periodic bursts of quick technique, which Carovillano handles smoothly. The final piece on this album is Reminiscence for Clarinet Quintet, which is approximately four and a half minutes long. Notably, Carovillano plays all five parts for the recording. This work is well written, allowing all parts to be featured. It has an autumnal mood that moves from contemplative, slow melodies into light, fun sections that eventually slow back into nostalgic lines. Overall Reflections is enjoyable and beautifully played. 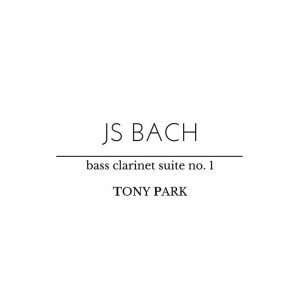 On this album, Tony Park performs his own arrangement of J.S. Bach’s Cello Suite No. 1 for bass clarinet. Throughout the work, his rich, expressive bass clarinet tone does a commendable job of mirroring the resonance and beauty of the cello. In the “Prelude,” Park employs tasteful tenuto on the arpeggiated sections and handles the problem of adding breaths to a string work admirably. He also makes good use of a wide dynamic range, keeping his interpretation interesting. In the “Allemande,” Park takes a conservative tempo that inhibits his phrasing a little, but shows a smooth and uniform tone throughout all ranges of the instrument. While the key noise in the “Courante” is a little distracting, he makes up for this with his impressive speed and prolific leaps between registers. Park handles the phrasing in the “Sarabande” with loving care. In this movement, his sophisticated use of ornamentation shines beautifully. In the “Minuets,” Park employs a lighter, bubblier style than one hears from most cellists. This results in a pleasant change of character, accompanied by varied articulations that keep the movement lively. Finally, in the “Gigue” movement, Park uses impressive breath support to drive the phrases in a way that is more characteristic of 20th century wind playing than baroque cello. Nevertheless, it is musically effective and Park’s re-imagination of this ubiquitous work is compelling and worth exploring.